Leading Manufacturer of poolside furniture, pool chair, wooden pool lounge, poolside lounger, pool lounge chair and swimming pool furniture from Pune. Associated Pools offer our valuable clients a wide assortment of Poolside Furniture. This furniture is fabricated by our professional craftsmen keeping in mind latest fashion trends. The offered product is available in various elegant designs and requires low cost of maintenance. 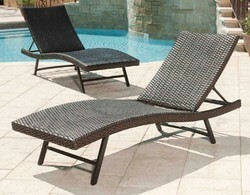 Pool chair is one of the most attractive and elegant kinds of furniture which we are offering our clients. These lounge chairs have been exclusively designed to suit the atmosphere of lounges and provide most comfortable and relaxing pose of sitting for a much longer period of times. These Pool chairs are available for our clients at a very reasonable range of prices. Associated Pools variety of pool lounge, which is made from the superior quality material. These stylish looking loungers are highly suitable and appropriate for adjustments for four different positions. These are offered by us are known for reducing the stress and minimizing tiredness. They can be easily moved and are made using advanced equipment. We provide them at competitive prices to our valued customers. We are paramount in offering an extensive gamut of Poolside lounger to the clients. This furniture is manufactured in compliance with the national as well as international standards of quality. Our products are crafted using the superior quality raw material, which makes these products highly effective. These products are available at market leading prices. Associated pools are paramount in offering an extensive of Poolside lounger to the clients. Associated Pools are among the leading names of the market that engages in proffering Swimming Pool Furniture that is easy to adjust. Manufactured as per the latest market trends, these robustly constructed and extremely comfortable furniture pieces are massively desired for.